Growing grass from seed is often difficult, usually because homeowners don’t keep the seeds sufficiently watered during germination and in the early stages of growth. With the use of mulch, you can help the soil maintain moisture because evaporation is reduced. You can apply many types of mulch to newly seeded lawns. Although straw is recommend over hay because hay contains seeds (which grow into weeds), you can still use it. However, use old hay, such as bails that are a year or two old, rather than freshly harvested hay, which is more likely to cause weeds. Separate the hay with your hands so you do not apply it in clumps. Lay the hay over your newly planted seeds. Use 50 to 80 pounds per 1,000 square feet, which is equivalent to about one to two bales. 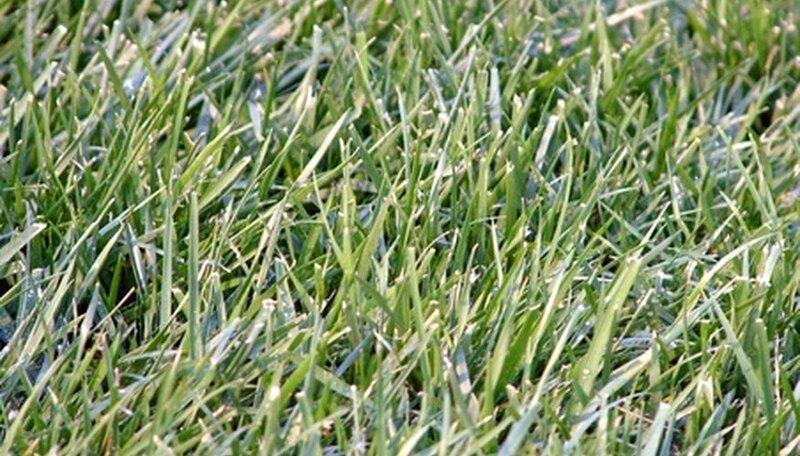 Look over your lawn and make sure that you can still see 50 percent of the ground. Add or remove the hay so you have 50 percent coverage evenly spread out across your lawn. If you cover your lawn more than this, remove half of it after the grass reaches about 1 to 2 inches so the grass can continue to grow well. Replace the hay as it is removed by the wind. Also remove or respread clumps of hay if they accumulate in your lawn due to the wind. Remove the hay the second year, if desired. The hay will eventually decompose or blow away, if it hasn’t already, but removing it from an established lawn is okay. Ohio State University Extension: What’s the Difference Between Hay and Straw? Gardening Know How: What’s the Best Natural Mulch for My Garden?